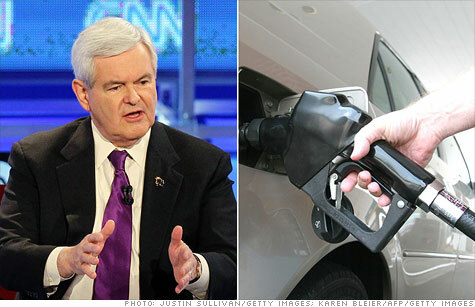 Newt Gingrich has a plan for $2.50 gas. NEW YORK (CNNMoney) -- Gas prices are on the rise, and so like clockwork, politicians are now selling the promise of lower prices at the pump. "I've developed a program for American energy so no future president will ever bow to a Saudi king again and so every American can look forward to $2.50 a gallon gasoline," Gingrich said during his self-introduction at Wednesday's CNN debate. The promise might garner attention on the campaign trail, but there's little politicians can do to influence the price of gasoline in the short-term, and long-run efforts are likely to be complicated by the global nature of the crude oil market. "Political rhetoric is all it is," said Guy Caruso, an economist who led the Energy Information Administration and worked as an analyst at the Central Intelligence Agency. "Short of price controls, which were a disaster during the Nixon administration, politicians can't do much to change the price of gasoline," he said. Other industry experts CNNMoney surveyed echoed those sentiments. "This is absurd," said Paul Bledsoe, a Bipartisan Policy Center scholar who spent more than 20 years working on energy policy in Washington. "Obviously the price of oil is set on a global market. In the immediate term there is almost nothing you can do." Gingrich's plan for lowering prices revolves around increasing domestic energy production to levels that would make geopolitical concerns an afterthought. The way to do that, according to Gingrich, is by eliminating the EPA, building the Keystone pipeline and allowing more drilling. "And at that point, if, in fact, the Iranians want to do something with the Strait of Hormuz, maybe the Chinese have a problem or the Indians have a problem or the Europeans have a problem," Gingrich said in a 28-minute video his campaign has produced on the subject. "But I am not sure at that point that the Americans will have a problem." But unless the way crude oil is bought and sold in the global market is drastically changed, the United States would still have a very real problem. Oil is a global commodity -- it can be shipped anywhere around the world. Its price is determined largely by global supply and demand. The United States would have to remove itself from the global trade in oil and gasoline to set its own prices, a move that could set the country up for a supply shortage and that most economists would not support. Caruso said it's just not a practical idea. "This is a global market with fungible supplies," he said. "We can't isolate ourselves." There's also the question of whether Gingrich's targeted production level is possible. According to a 2009 study from the government's Energy Information Administration, opening up to drilling areas off the East Coast, West Coast and Florida's Gulf Coast would yield just 500,000 extra barrels a day by 2030 -- not enough to replace U.S. imports or bring global prices down. The world currently consumes 89 million barrels a day, and by then would likely be using over 100 million barrels. By the time OPEC finished cutting production to adjust for the increased supply, Americans might save 3 cents per gallon. "The notion that somehow we can produce so much domestically that we will move the global price is incorrect," Bledsoe said. Meanwhile, the oil industry says that by expanding beyond offshore areas and drilling everywhere that isn't national park, an additional 10 million barrels of oil a day could come online by 2030 -- more than enough for the U.S. alone. All of this is not to say that oil production or prices are impenetrable to policy changes. Increasing domestic production is feasible, and even desirable -- but the impact on price will hit around the margins. "We need to be doing more energy, across the board," said Peter Beutel, an oil analyst at Cameron Hanover. "There are ways forward here that would be very positive," he said, while acknowledging that even with a massive production increase, it is difficult to predict a certain price point, as Gingrich has. "Who's to say whether it will be $1.75 or $2.75?" The Gingrich campaign did not immediately respond to a request for comment on how the predicted $2.50 price point was reached. Of course, it's not only Republicans who have proposed tinkering with government policy in an effort to combat high gas prices. During the Bush administration, then-House Speaker Nancy Pelosi urged the president to release crude oil from the nation's Strategic Petroleum Reserve to combat high prices. The White House rejected her call, saying that using the reserve to manipulate prices was "ineffective." "We were at the height of political season. You had all kinds of slogans and gimmicks and outraged politicians -- they were waving their three-point plans for $2 a gallon gas," Obama said. "And none of it was really going to do anything to solve the problem," he continued. "The truth is, none of these gimmicks, none of these slogans made a bit of difference."